Two-factor authentication (2FA) provides added security for logins, requiring a combination of something you know (password) and something you have (mobile device). Our Two-factor authentication (2FA) approach is based on TOTP: Time-based One Time Password (RFC 6238) symmetric encryption, secrets stored encrypted. This feature is available upon request. Please contact Airship Sales to enable this setting for your account. Please also see our Support article: Preparing for Two-Factor Authentication. Download the Google Authenticator mobile app for either iOS or Android. Log in to the Airship dashboard. 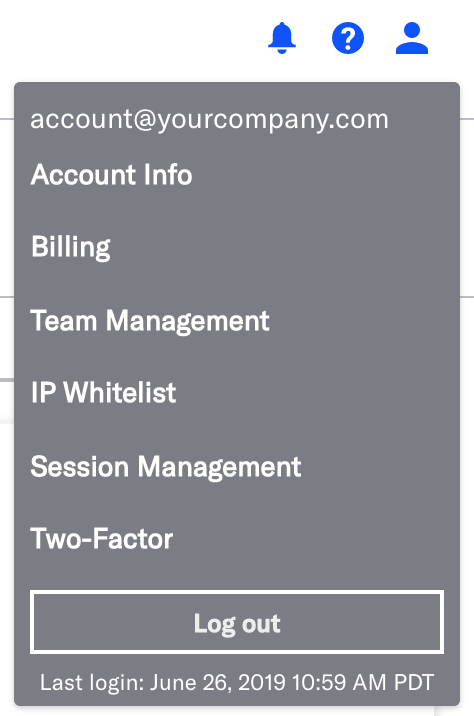 Click the Account menu icon in the right side of the header, then select Two-Factor, and enter your password when prompted. Toggle Two-Factor Authentication to On. Use the Google Authenticator mobile app to scan the QR code that appears after enabling Two-Factor Authentication. After scanning, an authentication code will be presented to you within the mobile app. Enter the authentication code in the Enter Code field below the QR code, and click Enable. Two-Factor authentication will now enabled for your account. When you scan the QR code with the Google Authenticator app, an Airship account is created within the Google Authenticator app. 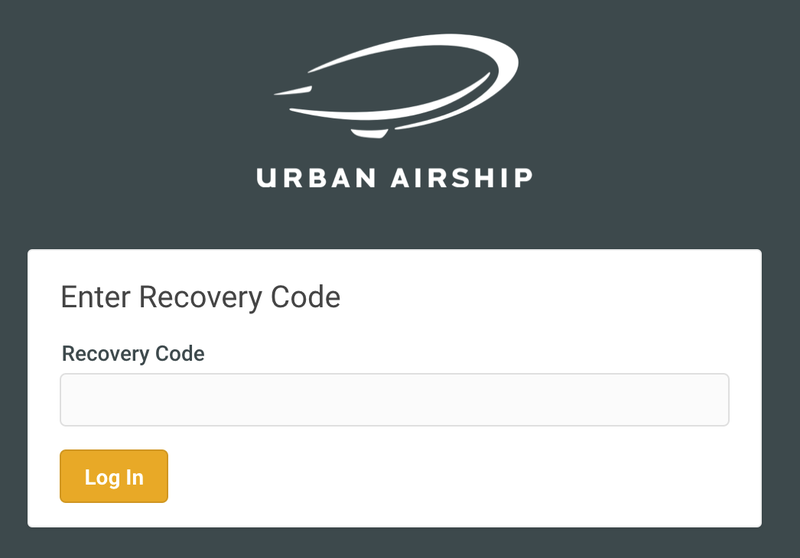 Each time you log in to go.urbanairship.com, you will use the code that is displayed with this account. See: Log In Using 2FA. You only need to scan the QR code a single time to set up 2FA. Each time you scan a QR code, a separate Airship account is created within the Google Authenticator app, so multiple scans are not advised. If for any reason this process has failed or you erroneously create multiple Airship accounts in the Google Authenticator app, delete each Airship account from the Google Authenticator app, toggle 2FA to Off and back On, and try again. Recovery Codes allow you to access your account if authentication is unsuccessful. Keep recovery codes in a safe place, not on your mobile device. Click the Recovery Codes link, then click Generate Recovery Codes. Copy the recovery codes, and save them in a secure location. Each recovery code is valid for one use only. Click Re-generate Recovery Codes to create additional codes. With 2FA is enabled, you are required to provide a code in addition to your password when logging in. 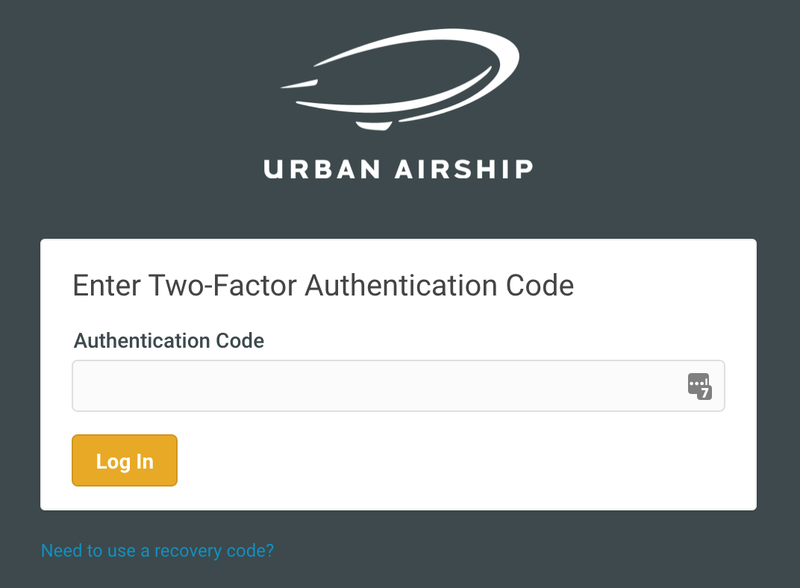 Enter your username and password on go.urbanairship.com, and you will be prompted for an Authentication Code. 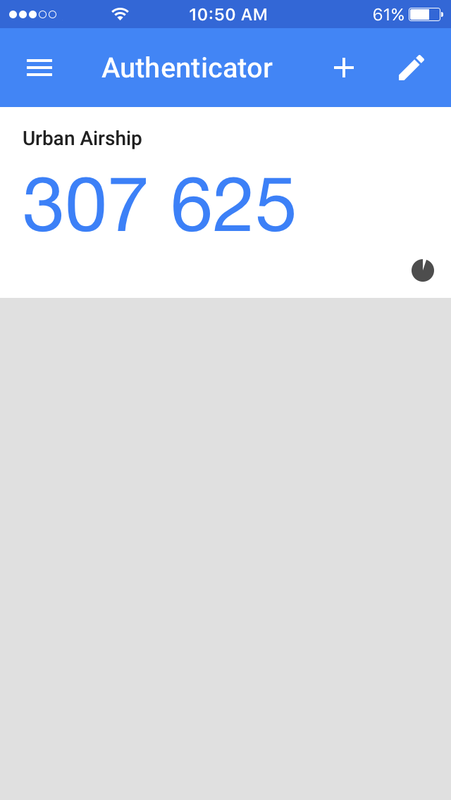 Open the Google Authenticator app on you mobile device to and copy the code for your Airship account. Codes re-generate every 30 seconds. Enter the code on go.urbanairship.com, then click Log In. If you do not have access to your mobile device but need to log in to your Airship account, you can do so using one of your recovery codes. Click the Need to use a recovery code? link. Enter one of your recovery codes, then click Log In. Each recovery code is valid for one use only. Follow the steps in Generate Recovery Codes to generate additional codes.